Katsushika Hokusai (1760- 1849) was an artist whose life demonstrated the joy found in hard work, continuous learning, and perseverance. This Japanese artist went by many names throughout his life, each of which reflected a different period of artistic transition. His most well-known name is Katsushika Hokusai; a name associated with the most famous of his pieces. 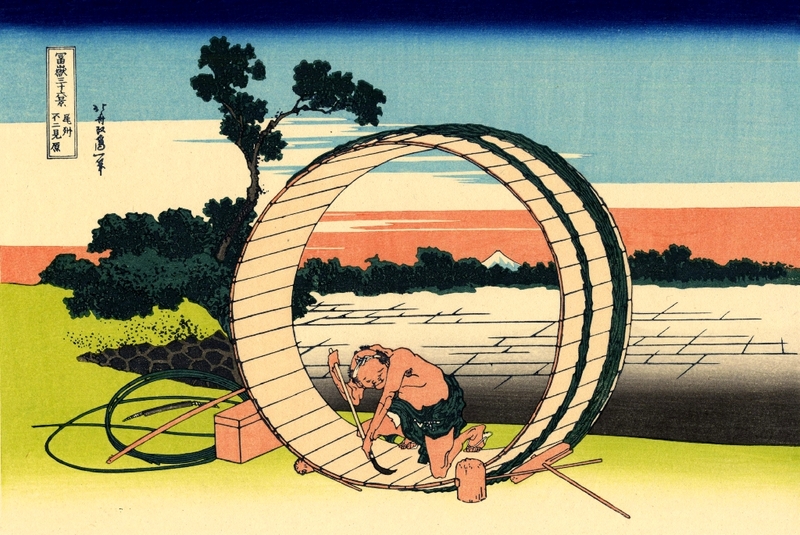 Katsushika Hokusai’s love of learning about and producing art began at the age of six. Most experts believe that Hokusai’s relationship with art began as he watched his father add artwork to the mirrors he made. Throughout his adolescent years Hokusai was exposed to the world of art while working in a bookshop and as an apprentice to a wood-carver. At the age of eighteen, he was accepted to an art studio called Katsukawa Shunsho which practiced the wood block print style called Ukiyo-e.
For a decade Hokusai immersed himself in the Ukiyo-e style, which focused on creating images of the courtesans. In 1779, while still studying at the Katsukawa Shunsho studio, he published his first prints. These prints were published under the name Shunro to reflect both the studio and its founder. When Shunsho, the studio’s master artist, passed away, Hokusai began to study other styles of art, including European styles. His dabbling eventually led to his expulsion from the studio since many of the styles he studied rivaled Ukiyo-e. Hokusai was embarrassed by this event, yet, his embarrassment only served to motivate his development and inspire his artistic career. At this point in his life Hokusai began expanding his subjects to landscapes and the daily life of individuals from all social levels. 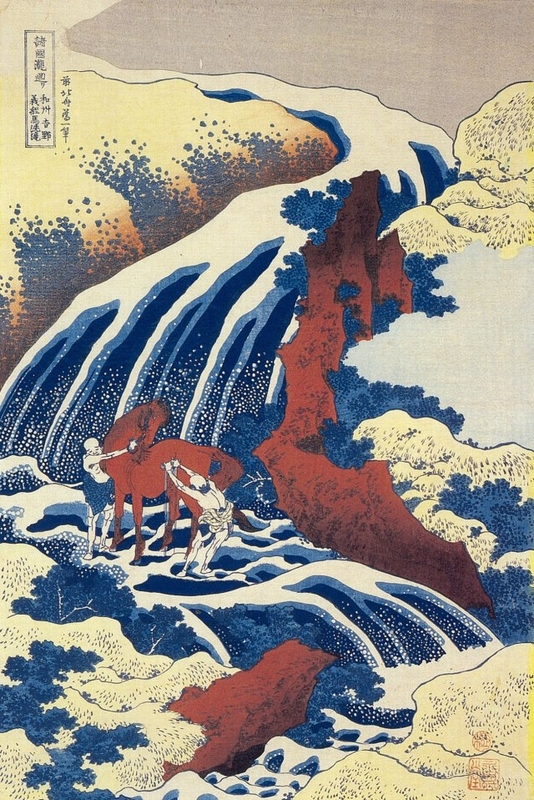 This was a breakthrough not only for Hokusai, but for the Ukiyo-e style as well. He became associated with Tawaraya School of art and thus adopted the name Tawaraya Sori. Under this name he published brush paintings and illustrations for books of humorous poems. By 1800, at the height of his career, he had adopted the name Katsushika Hokusai. Hokusai published two collections of landscapes: Famous Sights of the Eastern Capital and Eight Views of Edo. At this point, Hokusai had begun to attract his own students. This period of Hokusai’s life is also marked by stories that testify to his fearless and self- promoting character. One of these stories describes Hokusai painting a portrait of a Buddhist Priest that was approximately 600 feet long. It is said that he painted this enormous piece by using a broom and large buckets full of ink. Another story tells of Hokusai competing against other artists of his day in the court of the Shogun Lyenari. Hokusai won the competition by painting a blue curve on a piece of paper and then chasing a chicken, whose feet had been dipped in red paint, across the curve. When asked to describe his piece, Hokusai explained it as the Tatsuta River with red maple leaves floating in it. In the early 1800’s Hokusai went through many stylistic transitions and took on several different names. Under the name Taito he created the Hokusai Magna as well as other art manuals. This endeavor attracted more students. The twelve volumes he created included lessons and thousands of drawings of animals, religious figures, and everyday life. In 1820 he changed his name again, this time to Litsu. Under this name he painted several pieces that made him forever famous in Japan. These works include Thirty-six Views of Mount Fuji and The Great Wave off Kanagawa. During this time he also began to direct his work towards detailed images of single flowers and birds. In 1834 he changed his name yet again to Gakyo Rojin Manji, which translates as “the old man mad about art.” This was an incredibly fitting name for Hokusai at the time. During this stage of his life, Hokusai believed strongly that the work he had complete before the age of 70 didn’t amount to very much. He felt that he was only beginning to understand structures and how to make images come alive in his paintings. He prayed for a long life that would allow him to continue learning. In 1839 his studio caught fire and was destroyed. Still, Hokusai continued to paint. At the age of 87 he painted Ducks in a Stream. True to his continually inquisitive personality, Katsushika Hokusai lay on his death bed in 1849 praying for more time to become a better painter. He is remembered for his incredible talent, but also for being a man passionate about art who found joy in the struggle to learn and become more than what he was. This entry was posted in "out of the box" art, block art, Katsushika Hokusai, landscapes, Mount Fuji, Shunro, Ukiyo-e style, watercolors, woodblock print, Yoshisune Falls and tagged bock art, craft, Freer Gallery of Art, Gakyo Rojin Manji, Great Wave off Kanagawa, Happy Birthday, Hiroshegi, Japanese art, landscapes, Mount Fuji, paint by numbers, Segmation, watercolors on October 1, 2013 by segmation. Enter your email address to follow Segmation and receive notifications of new posts by email. Follow Segmation's "Outside the Lines"! Can Elephant Art Save the Species?